My family (except for one) loves soft pretzels. I found this recipe several years ago online. My family likes them better that Auntie Anne's or even Jo Jo's (a local pretzel place). 1 - Dissolve yeast into warm water. 2 - Add sugar, then flour. Mix well. 3 - Let rise until doubled, at least 20 minutes. 4 - Make pretzels. I made pretzels during summers in college, so I've made a video of my technique. You can just form them into a pretzel shape, though. 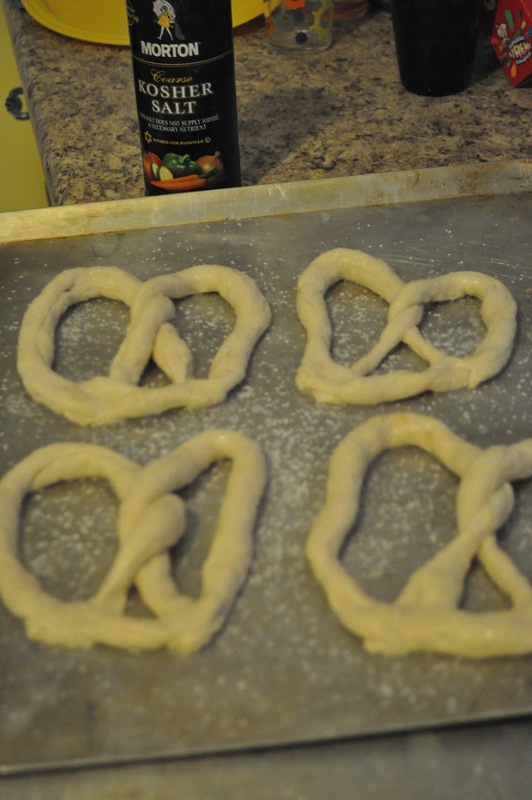 5 - Dip the pretzels in baking soda solution. 6 - Place on a GREASED (don't forget this part like I occasionally do!) cookie sheet. At the shop I worked at in college we used non-stick baking sheet liners, so you can use those as well. I think that's why I forget to grease them ... I didn't have to when I made them all those years ago. 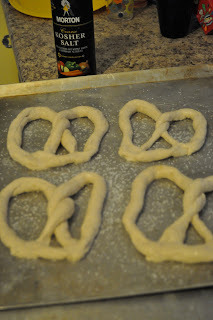 7 - Sprinkle with pretzel salt. I use Morton's Kosher coarse salt. 8 - Bake at 500-550 degrees F for 4-6 minutes. A very hot oven is very important for making soft pretzels! 9 - Once they come out of the oven, dip them in melted butter. They taste fine without this step, if you're wanting to keep the calories down. Of course, they taste even better with the butter! We usually serve ours with cheese sauce or honey mustard. You can also dip them in cinnamon sugar for a sweet snack! We have snacky things for dinner on Sunday nights, and this has become the favorite Sunday night meal at our house.